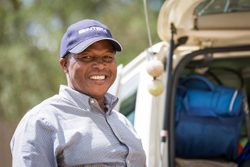 Mike Mutuku is Well Aware's Project Manager, overseeing all aspects of our clean water projects on the ground in East Africa. He first met Sarah Evans, founder and executive director of Well Aware, in 2010 when she and her team were visiting projects in Kenya. Sarah and Mike bonded immediately over their shared passion for helping people and communities, and from then on, Mike has been a crucial part of the Well Aware team, overseeing and monitoring all of the projects in Kenya.